Untold numbers died on the way to the coasts, on ships and upon far-off plantations. People were unceremoniously dumped, cast aside, committed suicide, hurriedly buried, left to be devoured by animals or simply rotted away. Part of the artist book series book of the bound, the work, abduction, was created at the very end of the series. Up to this point, I focused on using ornate textiles as symbols of wealth, privilege and prosperity by highlighting their role in the trade for slaves during the transatlantic slave trade. Increasingly, however, I began to ask, what represents this disfiguring commerce? Where evidence of the dirty duty that must had be done to someone to make them be a commodity? What filthy font of a facing page makes a relic of the ruin of an age in which a body was nobody except a body of work, a body worked to death with no word left of the life it lived? I needed a book to represent a text past its prime, one best left unread. Something to indicate that it was used beyond its normal capacity some thing without cover, without its own name, its front matter scattered to the four-winds and water-stained. It is the only coverless piece in the series. Finally, I understood the place it would take. 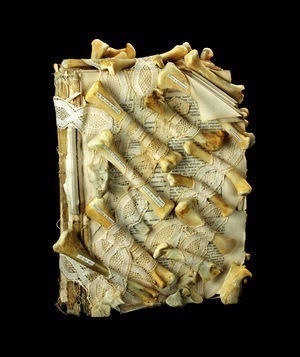 Its thread-worn spine revealing tattered signatures with bones held in place by chain-like lace. Underneath lace and bone, a cyclopedia and dictionary remind us of the tremendous loss of language, meaning and definition inherent in the state of being a slave.